Hannah began her relationship with the Augustinian Volunteers in 2008 as a volunteer in Lawrence, Massachusetts, serving as the Service Coordinator in Campus Ministry at Merrimack College in nearby North Andover. After completing her year of service in the summer of 2009, Hannah spent a brief period working in the non-profit sector before returning to work as the Assistant Director of the Augustinian Volunteers in July 2010, then Associate Director in July 2011. Hannah graduated from James Madison University in Harrisonburg, VA in 2008 with a B.A. in Sociology and minors in Art History and Religious Studies. 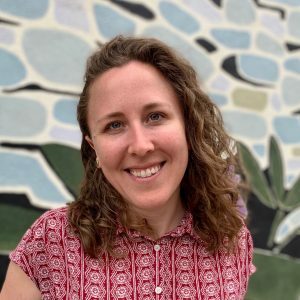 Born and raised in Southern California, she then spent her middle and high school years in the Philadelphia area, where she returned after her volunteer experience. Hannah has enjoyed the simple pleasures of having returned to someplace more familiar, like cooking dinner with her siblings and revisiting old traditions. In her free time, however, she enjoys exploring the unfamiliar—roaming new cities, hiking new trails, viewing new art, trying new food and reading about new ideas. A student at heart, Hannah appreciates not only the lessons of her own service experience, but also the ways in which she continues to learn from the current volunteers. She describes becoming part of the Augustinian family as nothing short of life changing and is thankful for the opportunity to help facilitate that experience for others.